For Liverpool (City and Borough) and its vicinity, we're showing you all the registered pools, some of them have no GPS coordinates and cannot be discovered on the map at the map. Swimming is a sport for all ages. It assists young people to tone their muscles and grow healthy and strong. For the elderly, there's no far better way to workout than getting a Liverpool (City and Borough) Swimming Pool to escape from day-to-day routine. Not all countries are the same, and swimming rules and regulations are changing from one country to the other. So, if this is your first time looking for Liverpool (City and Borough) Swimming Pools, be sure to contact the premises prior to you drop by. 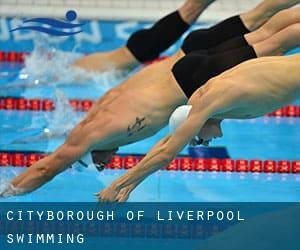 We probably do not know all of the Swimming Pools in Liverpool (City and Borough). Are you missing any? Contact us!. Are you on holiday and want to hold fit and healthful? Swimia.com offers you the effortless and quickest strategy to find Aquagym in Liverpool (City and Borough) near your present location. Most from the Liverpool (City and Borough) Swimming Pools offer both open lanes for independent swimming and also guided activities like water aerobics or Aquabike. There are numerous alternative treatments to chlorination, with amazing benefits that make sure better water quality in the pool. One possibility is the mineralizer, which purifies water naturally and substantially decreases the chemicals utilised and maintenance time. Try Chlorine No cost pools in Liverpool (City and Borough). Enjoy the best indoor pools in Liverpool (City and Borough) and don't worry about the weather. These facilities are open all seasons and you can enjoy a swim at the same temperature every day of the year. There are a number of reasons why you might want to choose a heated swimming pool in Liverpool (City and Borough). Probably the most essential one relies on the importance of keeping the body temperature stable. If the water is too cold, your body will try to warm it up and you will shed strength to swim correctly. One of the benefits of outdoor swimming in Liverpool (City and Borough) will be the possibility to sunbathe throughout the summer season. Taking it with extra care, sunbathing is healthy given that introduces Vitamin D into the body, so the most beneficial selection seems to be switching between indoor and outdoor pools based on the season. If you're tired of having eyes and irritated skin, discovering a saltwater pool in Liverpool (City and Borough) can be the remedy. You might want to understand that the degree of salt from these pools is well below the level of salt from sea water, specifically they are talking about a tenth or less. Updated on 2019 Speke Road , Garston , Liverpool , England , UNITED KINGDOM (Postal Code: L19 6PE). Among all the activities supplied by the centre, when you are enthusiastic about swimming you may enjoy 25 meters, 5 lanes, Indoors. Just in case you want to contact this Swimming Pool before dropping by, we only know the phone number. Washington Parade , Bootle , Liverpool , England , UNITED KINGDOM (Postal Code: L20 5JJ). Swimmers like you reported 25 meters, 6 lanes, Indoors. Phone number and email address are number for this Pool. Baileys Lane , Halewood , Liverpool , England , UNITED KINGDOM (Postal Code: L26 0TY). Among all the activities offered by the centre, if you are interested in swimming you will appreciate 25 meters x 16 meters, Indoors. If you need to make contact with this Swimming Pool, email address and phone number are both number. Carr Lane , Norris Green , Liverpool , England , UNITED KINGDOM (Postal Code: L11 2XY). Among all of the activities offered by the centre, if you're thinking about swimming you will enjoy 25 meters, 4 lanes, Indoors. Just in case you would like to get in touch with this Swimming Pool before dropping by, we only know the phone number. 6 The Aerodrome , Speke , Liverpool , England , UNITED KINGDOM (Postal Code: L24 8QD). Among all the activities offered by the centre, if you're interested in swimming you will appreciate 25 meters x 12 meters, Indoors. Just in case you desire to contact this Swimming Pool prior to dropping by, we only know the phone number. Longview Drive , Huyton , Liverpool , England , UNITED KINGDOM (Postal Code: L36 6EG). Swimmers like you have reported 25 meters, 8 lanes, Indoors. Also, you will find 25 meters, 4 lanes, Indoors. Just in case you would like to get in touch with this Swimming Pool before dropping by, we only know the phone number. Cherryfield Drive , Kirkby , Liverpool , England , UNITED KINGDOM (Postal Code: L32 8SA). Among all the activities supplied by the centre, when you are enthusiastic about swimming you may enjoy 25 meters x 12.5 meters, 6 lanes, 1 meters - 3 meters depth, 1 meters - 3 meters depth, Indoors. If you need to contact this Swimming Pool, email address and phone number are both number. North Parade , Liverpool , England , UNITED KINGDOM (Postal Code: L24 2SD). Among all the activities offered by the centre, if you are considering swimming you can get pleasure from 25 meters, 6 lanes, Indoors. Just in case you would like to contact this Swimming Pool before dropping by, we only know the phone number. Whereas Childwall is one of the six most populous cities in Liverpool (City and Borough), you shouldn't miss that one if you're visiting Liverpool (City and Borough). Fazakerley is one of the main cities of Liverpool (City and Borough), so it's should really be effortless to find Swimming Pool in Fazakerley. You're running out of excuses to swim, so do not wait anymore and go for it! It's difficult to visit Liverpool (City and Borough) without having dropping by Old Swan. Currently Swimia is showing you all the Swimming Pool in Old Swan along with the closest pools located in its vicinity. Swimming is usually a terrific concept to keep your body active in the course of your visit to Liverpool (Liverpool (City and Borough)), or perhaps if you're a local. Swimia helps you to find your closest Swimming Pool in Liverpool. Without a shadow of a doubt, swimming in Dingle will be the most beneficial method to unwind following work. Take a couple of minutes to browse Swimia's catalog to find a Swimming Pool in Dingle. Let us tell you a secret to forget about everything while you're in Knotty Ash: just select a pool and plunge into the water! There's no much more efficient method.